Look carefully at your neighborhood. Your investment strategy should be to work with a home renovation company in Phoenix to transform your home into comparable other houses in your neighborhood. You should select the projects that make sense for your area and will deliver a comparable home value to others in the area. For example, if most of the homes in your area have three bathrooms but your home has two, another bathroom makes sense. Your home renovation company in Phoenix can draw up plans for how to capitalize on this type of investment, assuming you actually need the extra bathroom to make your family’s daily life better. So, if you want to make money on the sale of your home, be careful how much money you put into any one remodeling project. A home renovation company in Phoenix with a good track record can help you determine how much you’ll likely get back on your remodeling dollars. Another example involves bedrooms. If most homes in your neighborhood are three bedrooms, two-and-one-half baths, but your home is only a two bedroom, one bath, you might consider adding a master suite with new bathroom. These types of projects can improve the value of your home and the return on your renovation investment. But, be sure you’re aware of the reverse situation. If you add a bedroom and bath, but your home is already the top-of-the-line for your neighborhood, you may not recoup your investment when you sell. The key is when you sell. If you plan to stay in your home forever and really need the extra space, you may be in a position to ignore the payback. Your home renovation company in Phoenix can help you throughout the decision-making process. Kitchens and Bathrooms – these remodeling projects top the list in terms of payback. And, they’re the main reasons homeowners want to remodel. A home renovation company in Phoenix can help transform your space into something practical, yet beautiful, and that fits your family’s lifestyle. Repairs – A beautiful new kitchen means nothing if your foundation in another room is cracking. Have your home renovation contractor in Phoenix look at your entire home to make sure you don’t have any structural, electrical, plumbing or other issues that could be dangerous or costly if left unrepaired. These types of projects must be done first, for your safety and the safety of potential new homeowners. Design – Adding a new kitchen or bathroom is great, but what if it doesn’t match the rest of the house? Your home renovation company in Phoenix can help ensure your projects are consistent, or they can help update the rest of your home. Many good remodeling companies have designers in-house that can help. The last thing you want is a new addition that looks like an addition! In this case, the money you put into you project can potentially decrease your home’s value. Outdoor Spaces – Often overlooked, many new home buyers are placing a premium on well landscaped and useful outdoor spaces. Extending your home to the outside makes a lot of sense. You can add to your usable square footage in a beautiful and innovative way. The general rule of thumb is to focus on maximizing your investment if you’re not going to be in the home for a longer time frame. If you plan to relocate in the near future, work with your home renovation company in Phoenix to make sure a premium is placed on ROI. On the other hand, more personalized projects can incur bigger investments. In this case, you’re concerned more about your lifestyle in your home than the investment return. Just be sure you plan to stay put for a long period of time. The bottom line is to be comfortable with your remodeling project both financially and lifestyle-wise. Make sure you don’t over-extend the scope of your project. 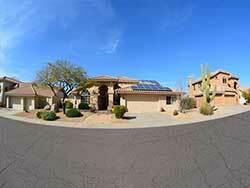 A proven home renovation company in Phoenix will help you work through all issues. They won’t push you into a project that doesn’t make sense or you can’t afford. Partnering with a trusted remodeling contractor is the number one decision you’ll need to make – and the one that will impact your project outcome the most.